NOVEMBER 2008 | SDTEKKEN.COM - TEKKEN News Resource! Tekken 6: Bloodline Rebellion is set for release in Japanese arcades on the 18th of December! More info on T6BR’s release when it comes in! Check out the latest Gamer’s Vision team battle tournament matches! You can view the rest of them here. Niigata Popy arcade has set up a live stream of their Tekken 6 action! When the stream is active, you can check out all the action here. To view older videos from the stream, scroll down and view them on your left. From CHALLENGER.JP, check out this tournament match between Law and Bob! Taiwan Tekken’s YouTube – New match videos from Taiwan! Check out their latest match videos! If you haven’t checked out our interview features with some of Japan’s top Tekken 6 players… check it out NOW by visiting the main page! From CHALLENGER.JP, check out this tournament match between Anna and Law! Tomi Gamers has updated their site with two new match videos! Check out action between King, Law, and Hwoarang here! sin2k2’s YouTube – Match videos from Hong Kong! These videos show ranking battles and feature a good variety of characters! Check them out! Depp402’s YouTube – New match videos from Brunei! Check out Tekken 6 action featuring tons of characters! bappara’s YouTube – More match videos from Japan! Check out the latest update with matches featuring Lee and more! 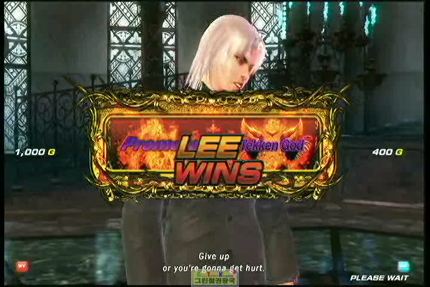 Check out this match from the HelpMe vs Rain death match where HelpMe was recently promoted to TEKKEN GOD! You can view the rest of the matches on our SD TEKKEN YouTube page! 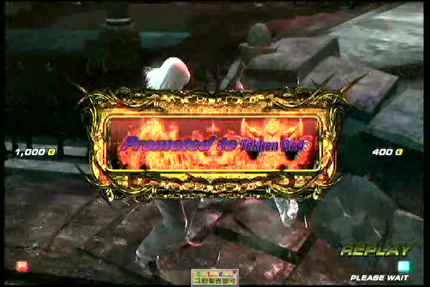 SDTEKKEN YouTube – Yes! We’re back! Check out some matches from Korea, some mirrors of the latest Kanachin matches and Tekken 6 matches courtesy of Nico video Japan! And more! amasyoku2008’s YouTube – Match videos from Japan! Matches featuring Law, Eddy, Dragunov, Marduk, Raven, Jack-6 and more! owenlml’s YouTube – New match videos from the Philippines! Check out the newest vids! Check out two match videos featuring Lei, Bob, Lee, and Dragunov! Korea has received a new update to their Tekken 6 machines! The latest update now features use of Tekken Net and the clan system! Also worthy of note, the first TEKKEN GOD rank has been crowned in Korea! Congratulations to clan Triple V’s Help Me! SDTEKKEN YouTube – Yes! We’re back! Check out some match videos from Nico video Japan and some mirrors to the latest Kenbou vs Otokonoko matches via JOYBOX! JOYBOX YouTube – New match videos featuring Anna, Yoshimitsu, Zafina and tons more characters!! JOYBOX has a TON of new videos uploaded all the time, so be sure to check their older uploads as well! SuperArcadeBox YouTube – Tekken 6 action from the recent 2 vs 2 tournament in Southern California’s Super Arcade! Check out all the action from the tournament! Check out this new Steve Fox combo video from Korea’s AoE team member, Hwoaranggongsing! Special thanks for uploading this ckopolnyong! SDTEKKEN YouTube – Yes! We’re back! Check out some misc Tekken 6 Bloodline Rebellion location test videos and Tekken 6 matches courtesy of Nico video Japan! And more! noknonnut’s YouTube – Match videos from Thailand! Check them out! JOYBOX YouTube – New match videos featuring Yoshimitsu, Zafina and tons more characters!! JOYBOX has a TON of new videos uploaded all the time, so be sure to check their older uploads as well! Depp402’s YouTube – New match videos from Brunei! Check out Tekken 6 action featuring Bryan, Miguel, Law and more! We’ve uploaded a ton of Tekken 6: Bloodline Rebellion Location Test videos on our NEW YouTube Channel! Check out this latest one and view the rest of them here. Tomi Gamers has updated their site with a new match video! Check out action between Marduk and Kazuya here. From CHALLENGER.JP, check out this tournament match between Bob vs Hwoarang! Deep Theater of KYSG has put together a small Tekken 6: Bloodline Rebellion combo video! Check it out! More of his videos can be found here. Also check new wall tech roll catches/traps by Deep Theater as well! Tomi Gamers has updated their site with a new match video! Check out action between King and Kazuya here. SDTEKKEN YouTube – Yes! We’re back! Check out some misc Tekken 6 matches courtesy of Nico video Japan! And more! bappara’s YouTube – Some new Tekken 6: Bloodline Rebellion match videos! Check them out! Check out all the new Tekken 6: Bloodline Rebellion videos! Thanks to navishiningstar for uploading them! Here’s a quick video of King vs Armor King! Look at that new throw! Check out the rest of them here. Check out Alisa vs King and look at about 1:00 in! King has a new wall throw followup that ends in a shining wizard! Awesome! SDTEKKEN YouTube – Yes! We’re back! Check out some misc Tekken videos and some recent mirrors of Shakujii and Kanachin matches. Also match videos courtesy of Nico video Japan! Check them out! Check out all the new Tekken 6: Bloodline Rebellion videos! Thanks to doslaosi for uploading them! Here’s a quick video of Marduk vs Nina! Check out the rest of them here. From CHALLENGER.JP, check out this tournament match between Bob vs King! Check out the main page for the Tokyo Game Show interview with some of the Tekken team members regarding the console release of Tekken 6! The next video features Law, King and Lee, courtesy of bappara! Also here are some impressions from our friend Reno! As far as the overall system goes, Rage system definitely got weakened compared to T6. There were less high damage combos because of it and overall it seemed like a good tweak. You still deal extra damage but it isn’t so gratuitous (IM) like in T6. Wall combos seemed to be changed too because a lot of people were dropping their standard wall combos… although people in general were dropping combos left and right… hmmm. The new stages are bloody awesome though! Electric Storm, Temple of the Earth, Sewers, Fountain were four of the new stages I saw. Electric Storm: takes place on top of a helipad with helicopters flying around. The setting is night time during a thunderstorm so there are random flashes of lightning along with a really, really cool water effect. Temple of the Earth: Floor is breakable in this stage. You start off in a apartment-like room and when you fall through the floor, you realize you’re in some sort of war-torn country with palm trees and such. The sky is blood red and there are explosions going off all around you. Sewers: Floor is submerged in water and there’s a fire constantly burning in the background with destroyed cars which pop up at random times. Fountain: This was shown in the trailers before, but it’s basically a circular walled arena with random water fountains around and inside the stage that shoot up. Looks really nice. Thanks for the impressions Reno! bappara’s YouTube – More match videos from Japan! Check out the latest update with matches featuring Lee! There is also a vid from the latest Bloodline Rebellion location test! Check the main page for a new video regarding the console release of Tekken 6! EvilBowlofCereal has uploaded match videos from the recent Northern California Tekken 6 tournament at Sunnvale Golfland! Check out the tournament finals below, you can also see the rest of the vids here. bappara’s YouTube – More match videos from Japan! Check out the latest update with matches featuring Lee! SDTEKKEN YouTube – Yes! We’re back! Check out some misc Tekken videos and some recent mirrors of Shakujii and Kanachin matches. We’ll be uploading more videos throughout the week! JOYBOX YouTube – New match videos featuring Heihachi, Bob, King, Law, Bryan and tons more characters!! JOYBOX has a TON of new videos uploaded all the time, so be sure to check their older uploads as well! heartbreakzel’s YouTube – New match videos from the Philippines! Matches feature Miguel, Leo, Lili, Kazuya, Jin, and Hwoarang! Dark Chaotix’s YouTube – New match videos from the United Kingdom! Check out match videos featuring Devil Jin, Kazuya, Kuma, Hwoarang and more! SDTEKKEN YouTube – We’re back! We only have a few videos now. But be rest assured, we’ll be uploading videos regularly again! Subscribe now if you’d like! The Super Battle Opera aka Tougeki 2008 DVDs are shipping NOW! The first wave of DVDs include Tekken 6, Virtua Fighter 5R, and Melty Blood Act Cadenza! Each DVD is packed with matches from the actual tournament. Watch the semi final and grand final rounds in entirety! You can BUY the DVDs now at Play-Asia! Tekken-Official announced a special Tekken 6: Bloodline Rebellion location test taking place in Japan from November 6th – 9th! For more details visit this page. From CHALLENGER.JP, check out this tournament match between Jack-6 vs Jack-6! AamaaKingu’s YouTube – Various match videos from the UK! Check them out! Depp402’s YouTube – New match videos from Brunei! Check out Tekken 6 action featuring Julia, Miguel, Jack-6, Law, Devil Jin, Lei and more!